Hyperloop One is well on its way to developing the world's first fully operational Hyperloop transportation system. The company revealed its progress on Tuesday at the Middle East Rail conference in Dubai, sharing pictures and footage of its Nevada development site dubbed "DevLoop." Taking Elon Musk's Hyperloop concept of a levitating pod in a low-pressure tube, Hyperloop One has developed what is so far the only full-scale, full-system Hyperloop test site. Back in May 2016, the company successfully tested its propulsion system and says it plans to test the entire apparatus this year. If successful, the first commercial application for the transportation system would be linking Dubai to Abu Duabi, a one-and-a-half-hour trip that would be reduced to just 12 minutes. Hyperloop One's DevLoop test structure spans 500 meters along the Nevada desert. 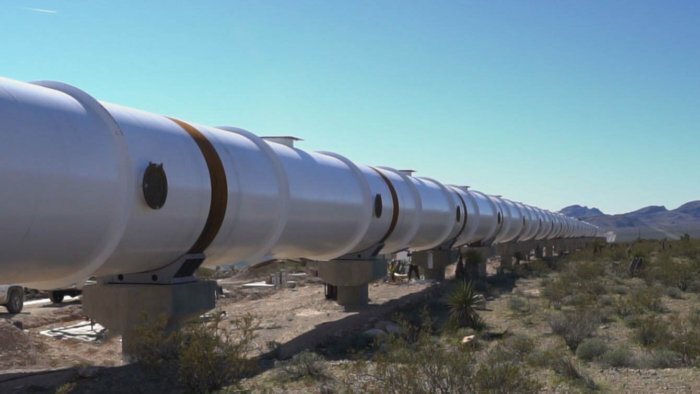 On it's website, Hyperloop One says that it hopes to be transporting cargo by 2020 and passengers by 2021.